By Diana Bronson - Executive Director of Food Secure Canada. This article was first published in The Chronicle Herald on June 29, 2015. Also “published on July 24, 2015 for Food Secure Canada's Eat Think Vote campaign"
After all, one in eight jobs in Canada is related to the food system. Diet-related diseases have skyrocketed, overwhelming our fragile health-care system — costing taxpayers tens of billions of dollars per year. Over four million Canadians experience food insecurity — and hunger has reached crisis proportions in many northern, remote and indigenous communities. Most of us would agree that each and every fellow Canadian has the human right to healthy food. With elections looming, we must ensure our new government reflects this conviction as well. A national food policy would unite the interrelated activities of scholars, entrepreneurs and advocates across fields, break down silos between government departments, and allow us to holistically approach the connected issues of hunger, unsustainable food production, climate change, and diet. Healthy food goes beyond nutrition. According to one widely-adopted definition, it’s the end result of a food system that sustains natural resources, advances social justice and animal welfare, builds community, and fulfils the food and nutrition needs of all eaters and into the future. 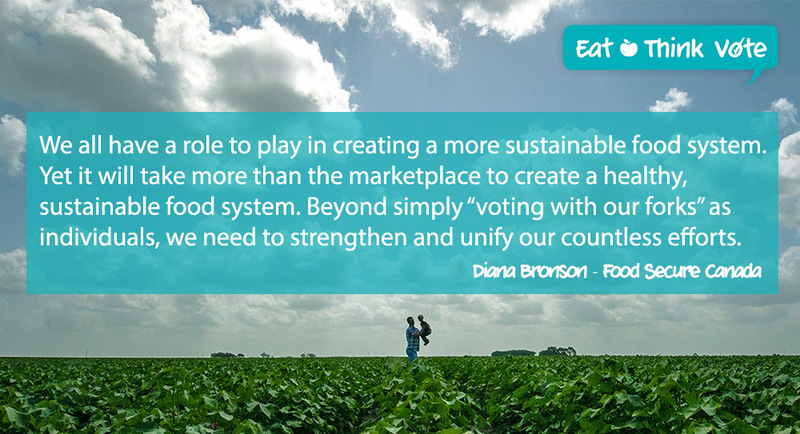 We all have a role to play in creating a more sustainable food system. Yet it will take more than the marketplace to create a healthy, sustainable food system. Beyond simply “voting with our forks” as individuals, we need to strengthen and unify our countless efforts. Why aren’t we encouraging farmers to grow more of the healthy fruits and vegetables we need to increase in the average Canadian diet? Why aren’t our publicly funded institutions procuring more local food and making the food they serve healthier? Why don’t we take a page from the anti-smoking lobby and use taxes, public health and sensible regulations to diminish the impact of junk food on our children? Why don’t all children in school have a healthy meal every day to enable them to reach their full potential? 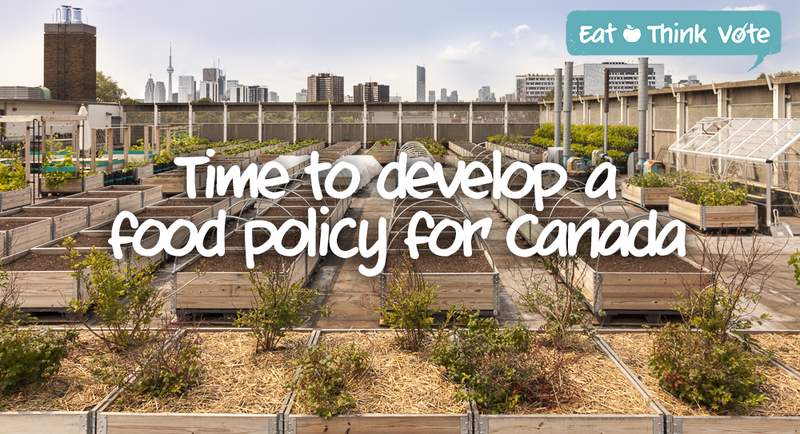 To take action on these questions, Canada urgently needs to adopt a food system approach. We need to be smarter in how we fix our food system with fresh thinking and innovative, cross-cutting national policies across agriculture, environment, economics and health in order to create healthy, sustainable food system that feeds us all. 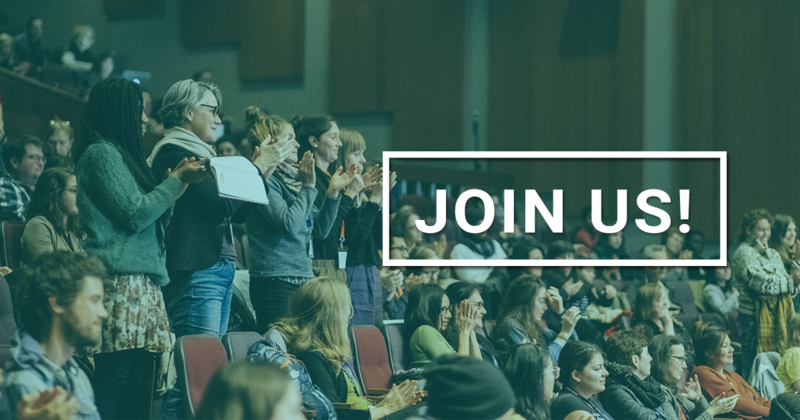 The Eat Think Vote campaign is calling on all candidates running in the next federal election to commit to a national food policy, and to engage in a dialogue with communities on how to build a food system for the future. Among the many voices calling out for such a policy are farmers, doctors, dieticians, scholars, food banks, think tanks, citizens, community groups, and businesses. Support the next generation of farmers who will provide sustainable, local food. None of us can fix these complex problems alone. The federal government must play a leadership role in bringing together all stakeholders in our food chain. Which political party is prepared to step up to the plate?